So I think it's pretty obvious that if I have a favorite writer, it's Alan Moore. I greatly enjoy his stories and I think that part of what makes him the greatest writer of all time is his ability to bring out the absolute best in his artists. With very few exceptions (namely Gene Ha, J.H. Williams III, and Bill Sienkewicz), I can safely say that when Moore has worked with someone, that artist has never looked better. And of course there's all the accomplishments. He won nine of the first eighteen Eisner Awards for Best Writer. He popularized the use of literary techniques such as irony, symbolism, and whatnot in mainstream comics. He's written at least three game-changing books. But the man is not infallible. In fact, I think sometimes, something gets lost in his mass of literary talent. Something primal. Something visceral. But it's best if I use visual aids, so here I am presenting you with the Top 5 Most Disappointing Moments in Alan Moore Stories! What's the Deal? The entire story of THE KILLING JOKE hinges upon the idea that Batman and the Joker are polar opposites of each other, and that they'll end up killing each other if they don't find a way to make peace with each other. 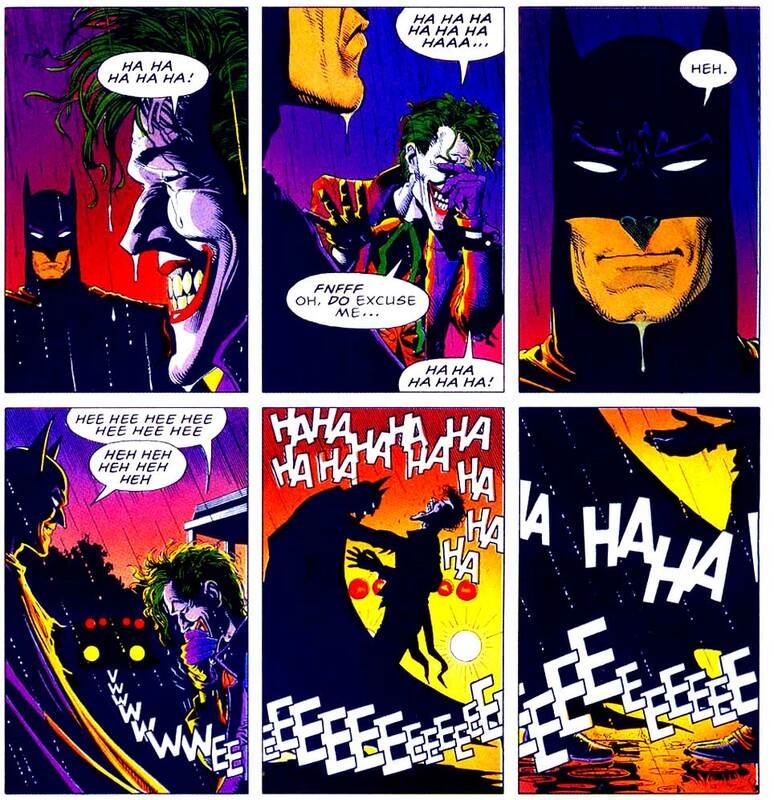 Aside from it not being the most innovative premise for a story, when Batman gets to the Joker at the end, the Clown Prince of Crime tells him a joke that perfectly summarizes their relationship. And the thing is, Batman laughs with him. may be holding him for the cops. This moment isn't really "disappointing" — it fits the (admittedly weak) theme of the story. But it is dumbfounding when you take context into account. The Joker had just shot Barbara Gordon and tortured Jim Gordon, and Batman's here, laughing at his joke. It gets even more dumbfounding when you think of future Batman/Joker stories — how can they possibly be taken seriously given this turn of events? That Brian Bolland art is gorgeous, though. What's the Deal? 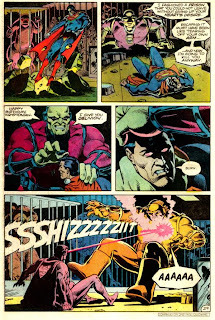 Alan Moore, with artists Joe Bennett, Rick Veitch, and Chris Sprouse, have, at this point, spent 11 issues filling in Supreme's past and present, making him a true analogue to the Silver Age Superman. By the 12th issue, his Citadel Supreme (Fortress of Solitude) is brought under attack by Darius Dax (Lex Luthor), and he has to call on his friends Suprema (Supergirl) and The Allies (The Justice League) to help him out. Things take a turn for the worse when Dax acquires the body of Magno (Amazo). So you basically think at this point that we're going to see how awesome Supreme is, right? Not really. 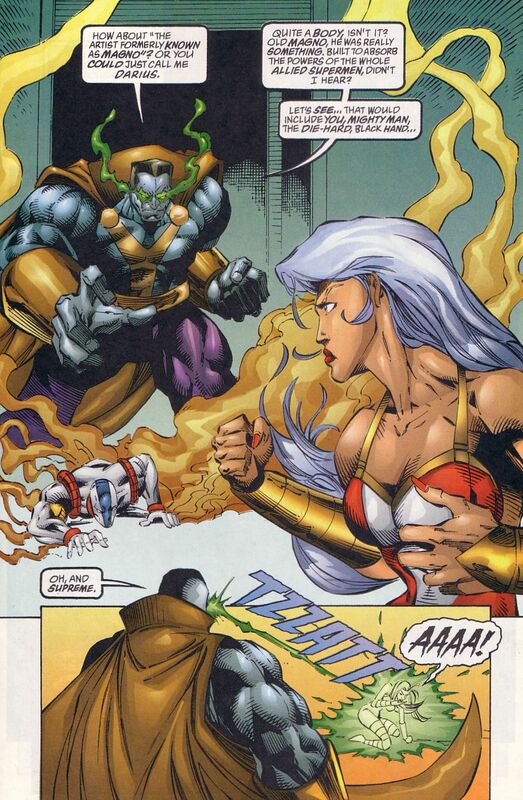 Supreme basically chases him around and undoes whatever damage he does, but it's too late. Dax has gotten to the Supremium sample (Kryptonite, kinda) in the Citadel, and plans to merge with it, causing a big chain reaction that has him falling through time and becoming an inanimate piece of Supremium. Trust me when I say that it makes sense when you read the whole thing. Again, it's appropriate to the themes and items established throughout the story. But damned if it's not missing that visceral feeling of awesomeness we'd have gotten if Supreme just punched Dax on the jaw. What's the Deal: The League of Extraordinary Gentlemen has to deal with a bunch of Martians. One of them, the Invisible Man, has already betrayed them. To act swiftly, their superiors send Mina Murray and Alan Quatermain to see Dr. Moreau (from The Island of...) and pick up one of his hybrids, which is supposedly their secret weapon against the Martians. Before they can release it, Edward Hyde goes nuts on the Martians and destroys some of them. And then he dies. And then the hybrid is released. What is it? That's right. It's a virus. It leads to Nemo quitting (after doing practically nothing for the whole volume) and Murray taking a sabbatical. I'm sure Moore was making a point about biological warfare, but at this point in the story, something was calling for the Martian fleet to be socked in the metaphorical jaw. What's the Deal? 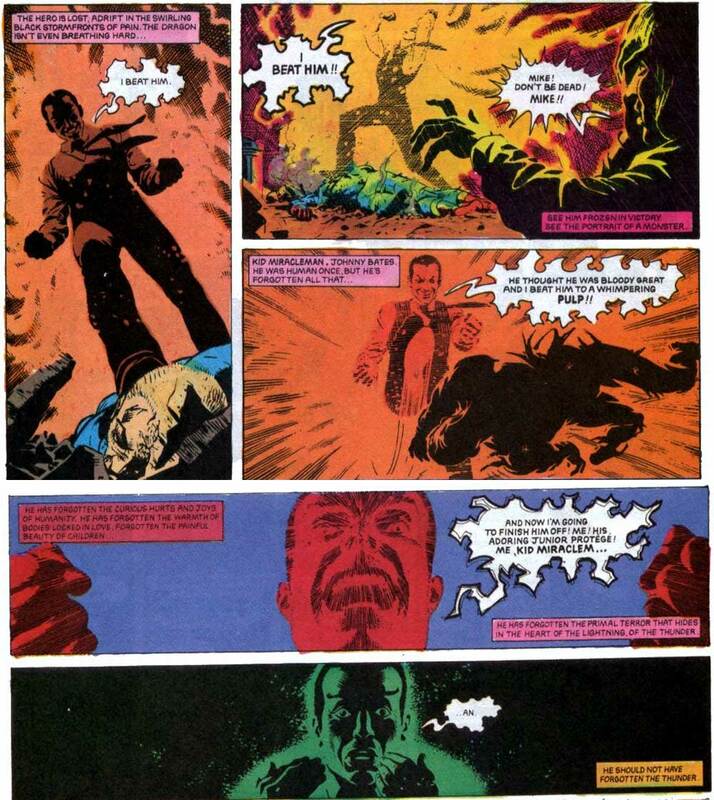 This is kind of a cheat because it happens twice, but in the first story arc of Miracleman, the protagonist finds out that his old sidekick, Kid Miracleman (who uses the word "Miracleman" to change between superpowered and non-superpowered forms), has turned evil. So they fight, and Kid Miracleman wins, only to be brought down by accidentally saying the magic word. That's all well and good — Miracleman had just returned, after all — but 13 issues later, Kid Miracleman razes London and Miracleman has to stop him. He brings in some friends, such as Miraclewoman and a Warpsmith. The fight is long, violent, and awesome. But in the end, again, it's not Miracleman who stops him, kind of diluting the visceral part of the experience. The thing is, it wouldn't have changed the story that much if he'd delivered the final sock to the jaw. What's the Deal? 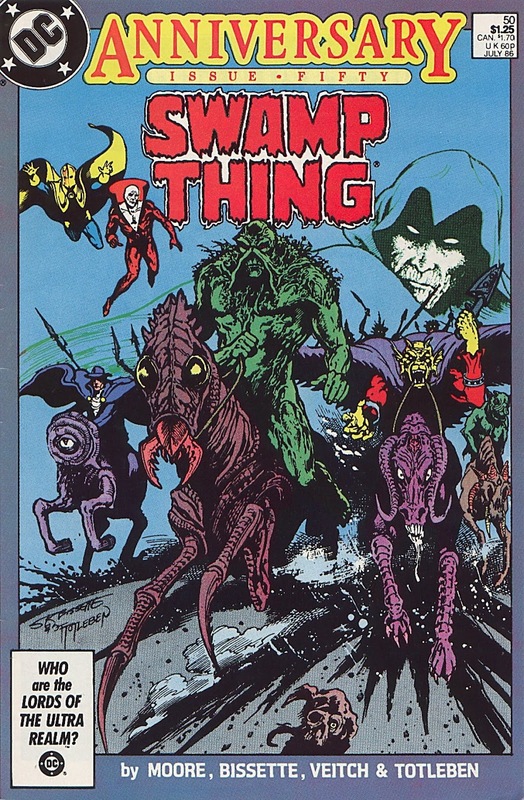 In the epic story that both crosses over with CRISIS ON INFINITE EARTHS and introduces John Constantine, the Hellblazer, Swamp Thing has to go to hell to confront the primordial darkness, the thing that existed before God created light. It's one hell of a set-up, involving demons, angels, the Phantom Stranger, and the Spectre in the supernatural realms, and characters like Baron Winter, Sargon the Sorcerer, and Zatanna in the earthly realm. So basically, how does it end? Well, Swamp Thing talks to it. That's it, really. The ultimate darkness talks to Etrigan the Demon, Dr. 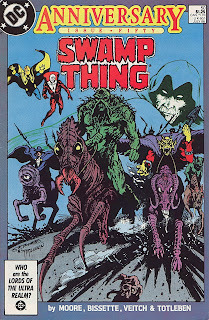 Fate, and the Spectre, trying to comprehend what evil is, and finally Swamp Thing gives it an acceptable answer, which is completely telegraphed and foreshadowed by the (excellent) "Parliament of Trees" story just a few issues before. Moore was making a metaphysical point about the repetition of the good-versus-evil theme, and he made it well. But again, it lacks the visceral awesomeness of a sock to the jaw. What's the Deal? This is the big one for me. It's Superman's birthday, and Batman, Robin, and Wonder Woman go visit him at the Fortress of Solitude only to find a plant called a Black Mercy attached to his chest. The Black Mercy places its victim in a dreamlike state in which his heart's desire is realized, so Superman is in a state in which Krypton never exploded. (But as a result, Jor-El went crazy and Kal never met Lois, so I'm not sure how this was his heart's desire to begin with.) The Warworld tyrant Mongul introduces himself as the man responsible for Superman's current situation, and Wonder Woman instantly takes to fighting him while Batman tries to get the Black Mercy off of Superman. And when he finally does, it's awesome. 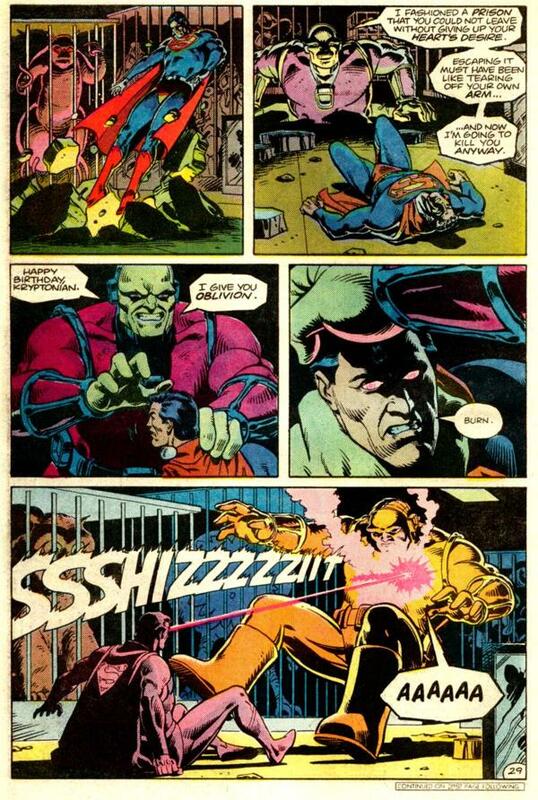 Superman goes to fight Mongul, leading to perhaps the most badass Superman moment ever. 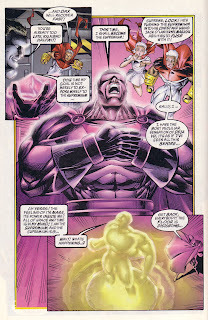 Mongul says, "Happy birthday, Kryptonian. I give you oblivion." And Superman replies, "Burn." HE LOSES! 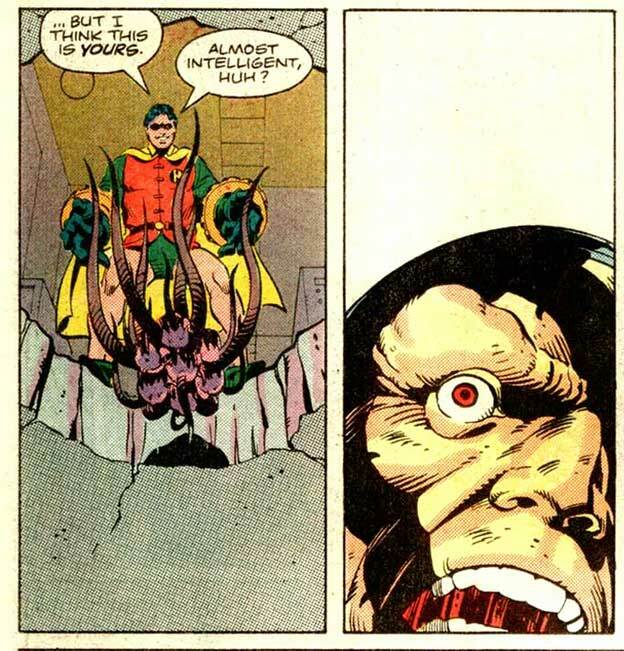 And then Jason Todd saves him. 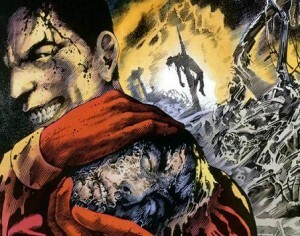 JASON TODD. Oh, sure, I get that he missed Krypton and that he got distracted and it was an emotional goodbye and everything, but seriously. JASON TODD. The lameness cannot be justified. At least when they adapted it for Justice League Unlimited almost twenty years later, they wisely had Wonder Woman recovering and doing the save. Also, that was a Justice League show, not a Superman show where you may expect, I dunno, Superman to land the final sock in the jaw. In other words, Cubers, deep themes, nuance, irony, symbolism, metaphors, wordplay, and all that stuff is all fun and everything, but sometimes, just sometimes, there isn't a substitute for a good old-fashioned sock in the jaw. 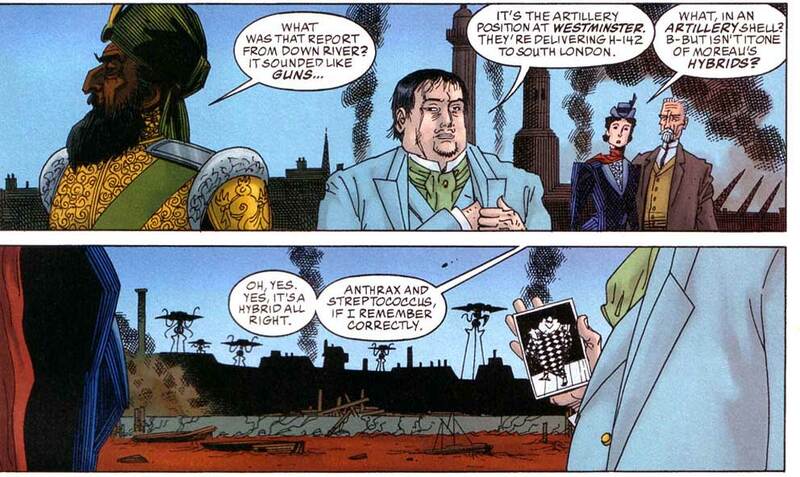 Hmmm.... For me, the League of Extraordinary Gentlemen ending wasn't disappointing, though. The martians in the story were, after all, War of the Worlds Martians so it was already pretty likely that Moore would choose to keep the 2 popular defining characteristics of those types Martians when they made their appearance in League, (tripods, dies in the end due to germs - and in League's case viruses). I get that; I think my big disappointment in the end is that the three remaining Leaguers don't actually end up doing anything. No, no, no! The whole point of "The Man Who Has Everything" is that you should never take your eyes off the little yellow one. It masquerades as the ultimate Silver/Bronze Age Superman story, but it’s really another story about the little new guy coming through in the end. The whole point of "For the Man Who Has Everything" is that "What ifs" and "could've beens" most likely wouldn't have really made your life any better. The Robin stuff is tacked on. And it wouldn't have made any difference to the rest of the story if, say, Superman punched Mongul down, then Mongul got up, ready to fight some more, and THEN have Robin throw the Black Mercy on him. Alan Moore or no, at the end of the day, it's a Superman story, and Superman should be saving the day. 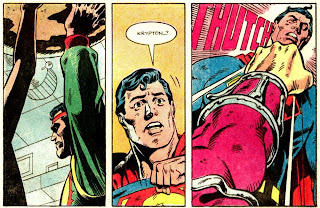 The adrenaline rush of Superman delivering the knockout punch was omitted for no reason, I think. Though Robin's crucial role takes the spotlight away from Superman, it also fits into the story's theme. 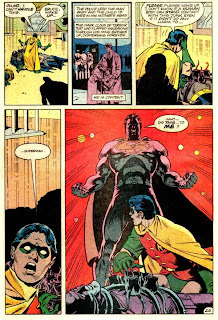 As the new hero in the mix (emphasized in his entrance) and as the young hero (Robin has long been the DC's top symbol of youth), he stands apart from Superman and Batman because he's not haunted by the past. He represents wide-open potential. Symbolically he's not prey to regrets and thoughts of how things could’ve been, concerned only with what to do next. 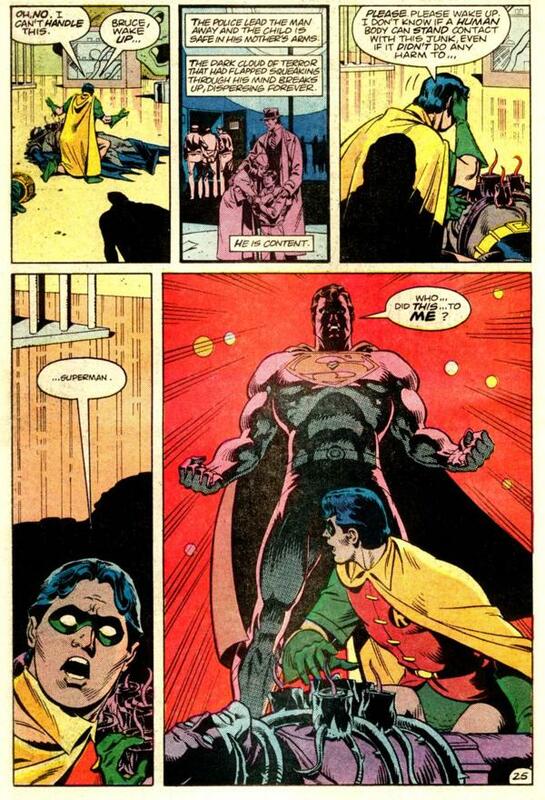 And of course Robin's the least powerful, most ordinarily human of the heroes in that story, the one who can speak for the species when he drops the Black Mercy onto Mongul. I see your argument, and if I were more of a Superman fan I'd agree he wasn't getting to be all the honors due the birthday boy. 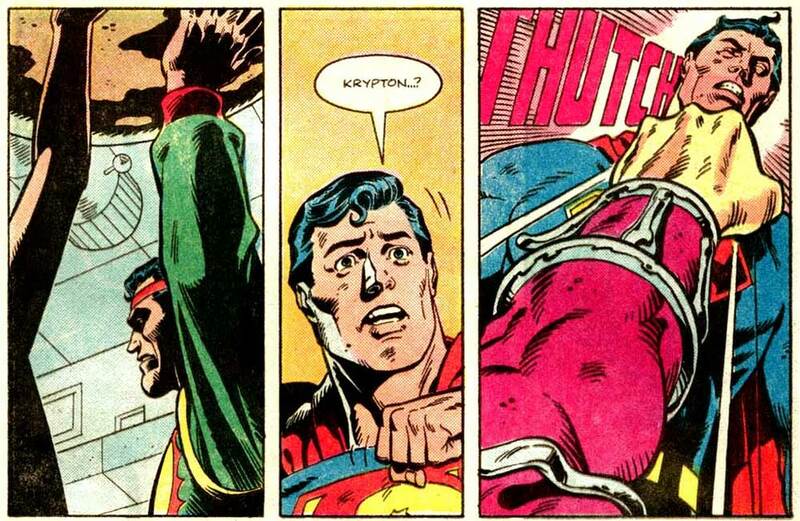 But we do get a fine Man-of-Steel adrenaline rush in one panel/line: "Burn." That's likely the best defense of that ending I've ever read. J. L. Bell's reasoning for For the Man Who Has Everything is spectacular, so I will seek to defend The Killing Joke - probably in a less than spectacular way. The way I recall interpreting it was that Bats despaired that, ultimately, his feud with the Joker would end in death, either for himself or the Joker. They are two sides of the same coin in that both of them are obsessively driven. Batman is driven to battle crime. Joker is driven to battle authority. I took all of that as the subtext with the "joke" being the framing device of the whole story. My reasoning is that Bats laughs because he realizes that his relationship with the Joker is similar to the 2 inmates from the joke. Joker is the guy who jumps headlong into chaos (or the rooftop). Bats is the guy who hesitates at repeating the insane stunt. The first guy in the joke is obviously insane, like the Joker, especially when he offers to shine his flashlight's beam for the other guy to walk across. The 2nd guy seems less insane because he seems to be aware of consequences. UNTIL, he gives his reason: that the first inmate would turn the flashlight off while he was walking across it. For me, this is why Bats laughs at the end. He realizes that he's the 2nd inmate, just as crazy as the 1st one but for different reasons. Bats' "insanity" is that he constantly does the same thing over and over, always expecting a different result, i.e. capturing the Joker and returning him to Arkham, despite the Joker constantly escaping and terrorizing the citizens of Gotham that Bats seeks to protect. I think the thing is that Killing Joke ending works as the ending to the Killing Joke, but as the predecessor of the next Batman/Joker story, it ends up highlighting the futility of the next story. What's the point? In much the same way, as much as J.L. 's thematic defense of the Robin scene makes sense, it robs the Superman fans (whom I assume bought the book because Superman is the title character) of the big finish. One of my biggest problems with modern superhero comics is that too many problems are solved with that visceral sock in the beezer. I much prefer solutions that involve cleverness on the part of the hero, or even a clever, unexpected, yet logically consistent twist of fate. Beating the bad guy with sheer strength is to me a disappointing, and slightly sad, ending. My contention with that is that too much unpredictability inevitably makes a writer predictable. Not sure I understand that, or how it applies here, but to each his own. Just that continuing to buck the standard trope for the sake of unpredictability eventually makes a writer predictable. Look at that Miracleman thing. It happens twice. Hmmm, OK. I'm primarily a Silver Age DC guy (Schwartz titles in particular), so I don't think of the sock-in-the-jaw as a "standard trope." To my eyes, it's not cathartic, it's weak writing. But then again, even the occasional SA Green Lantern story was wrapped up with a solid right hook. I always thought the big twist at the end of "The Killing Joke" was that the Batman too had gone a bit mad, and he KILLS the Joker. Had the Cube never heard that before?